Our next giveaway is for the Your Minder alarm clock from MedCenter Systems. 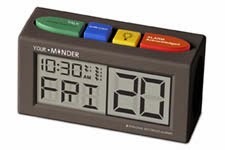 Help keep people organized and on schedule with the Your Minder recording alarm clock. With six ten-second personalized reminder alarms and a red acknowledgement button on top of the clock to shut off the current alarm, you can make sure the forgetful person in your life will stay on track and not miss their daily or weekly medication or activities. Not just for the elderly, you can use it for kids to be reminded of home work or just to help kids take care of a new pet. This can be used for so much more. Check it out below. After entering stop over and enter more giveaways HERE. The giveaway is for your own Your Minder alarm clock and is open to US residents who are 18+, void where prohibited. Entries will be accepted through 7/27/14 at 11:59 pm EDT. Java John Z’s and the blogs participating are not responsible for prize fulfillment/shipment. This blog was not compensated in any way for the promotion of this giveaway. Facebook, Twitter, Pinterest, and any other social media are not affiliated with this giveaway. If you have any questions please contact the host of this giveaway. I have an elderly neighbor I help out and this would be great for her! My husband and I , thanks. I could use it, I always need reminders for things! I could really benefit from this. I always need reminding! This would be perfect for my mother in law. She needs some reminders sometimes! I would give this to my nephew who is headed of to college. My daughter who is just starting school and could use some cute ‘wake up’ notes. My handicapped brother, who lives in a nursing home, needs something like this!